Join us for an evening in Manhattan to talk business and the economy with noted investment strategist Byron Wien ‘54, MBA’56. 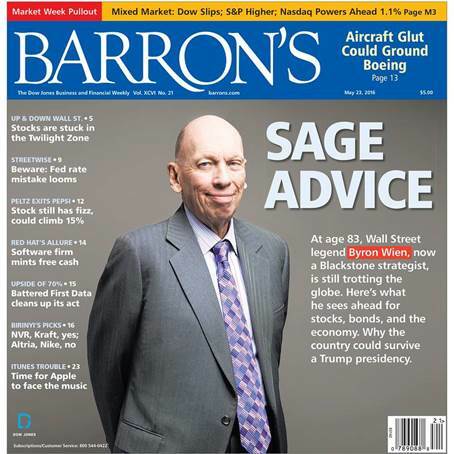 Byron Wien is Vice Chairman of the Private Wealth Solutions Group at Blackstone, where he acts as a senior adviser to both the Firm and its clients in analyzing economic, social and political trends to assess the direction of financial markets and thus help guide investment and strategic decisions. Prior to joining Blackstone, Mr. Wien was Chief Investment Strategist for Pequot Capital and before that served for 21 years as Chief (later Senior) U.S. Investment Strategist at Morgan Stanley. His annual “Ten Surprises” lists that re reveals every January are a must read beyond the investment community. He has been named the “most widely read analyst on Wall Street (First Call, 1998); ranked as the No. 1 strategist (StartMoney.com, 2000); named to SmartMoney’s Power 30 list of most influential thinkers (2004); named one of the sixteen most influential people in Wall Street (New York Magazine, 2006); and received the lifetime achievement award from the NY Society of Security Analysts (2008), among many other accolades. Join us in Manhattan for a 3-course dinner in the private dining room dinner at Ammos Estiatorio, a Mediterranean restaurant located across from Grand Central Station. This event is currently limited to 24 attendees. Please be sure to purchase tickets early as we may sell out and we will most likely not have ticket sales at the door. Please contact James Black ‘96 for questions. Bernard Katz & Co., P.C.